David Bomberg taught drawing and painting at Borough Polytechnic, later to become London South Bank University (LSBU), from 1946 to 1953 where he earned himself a reputation as a radical teacher who favoured an approach that allowed his students to find their own individual artistic vision. Bomberg’s defiance of established teaching methods of the day contributed to his reputation as an outsider, though he thrived partly for this very reason, as his students were attracted by his reputation as an extraordinary and visionary teacher. Bomberg went on to become a lasting influence on a generation of promising artists at Borough Polytechnic, and beyond. 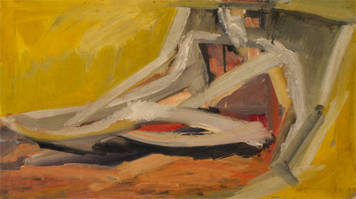 The exhibition, to take place between 22 April to 2 July 2016, will use work by David Bomberg, from A David Bomberg Legacy – The Sarah Rose Collection to examine the approach of this unique artist teacher, and will include the works of five artists who studied under him: Dennis Creffield, Cliff Holden, Edna Mann, Dorothy Mead and Miles Richmond. The exhibition will also include a rich array of archive and documentary material, with first-hand accounts from Bomberg’s students on his teaching style and approach. A specially commissioned talk on Bomberg as an artist teacher with independent historian, Kate Aspinall. An in-conversation with Dennis Creffield, acclaimed artist and former student of Bomberg at Borough Polytechnic. A focus on another iconic artist teacher Richard Hamilton, with independent curator Gill Hedley. Practical workshops for art students in collaboration with, amongst others, Camberwell School of Arts and Wimbledon School of Arts. A site-specific commission with artist Lucy Harrison to engage directly with the students of LSBU. Janet Jones, Dean of LSBU’s School of Arts and Creative Industries, said: “The work and legacy of David Bomberg, and the artists he taught at Borough Polytechnic, epitomises LSBU’s history of exceptional, influential teaching dedicated to creativity as a vocation. “Borough Road Gallery has gone from strength to strength since opening in 2012, working hard to promote a dynamic programme of visual arts activity, research and scholarship.